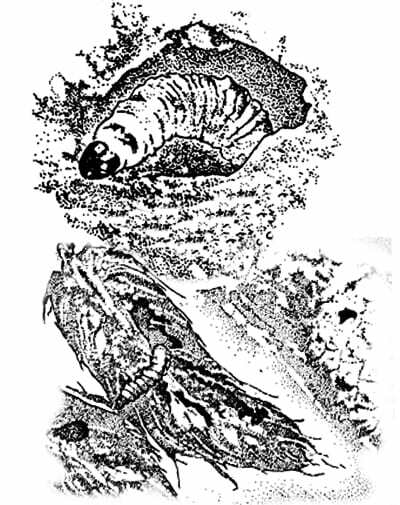 The Larvae is Yellow-white with black head capsule in first instar; pink to yellow with brown head capsule in final instar. Afterwards they pupate or overwinter near axis of cone in papery resin-coated cocoon perpendicular to cone axis among resin-coated scales. The adults are Moth about 1/2 in. long. Silvery gray with dark russet-brown traverse stripes on forewings; wingspan 1/4-3/4 in. Infesting Douglas fir trees in the United States they can be found on the West coast and Rocky Mountains and in British Columbia. Poor sites, drought, nutritional deficiencies, heavy cone crop all contribute to infestations. They extrude resinous exudations between scales and cones may be misshapen (distored), with frass on the surface. Adult Flight occurs in early spring with eggs deposited on protruding bracts of young cones in May to early June. Young larvae reach cone scales by boring into bracts through a torturous resinous tunnel, with an opening at the surface through which resin and larval castings are exuded. Feed first on scales, then the seeds for about 2 months. Cone is not killed by initial attack, but heavily infested cones usually wither before maturing. Resinous exudations between the scales prevent opening to release uninjured seeds. Pupae form in July and August. Moths emerge in April and May of the following spring. There is one generation annually, with part of the brood retarded as pupae, passing through a biennial generation.